The full-size pickup trucks are the best-selling vehicles in the US for years now and modern models combine maximum utility and passenger-friendly features. 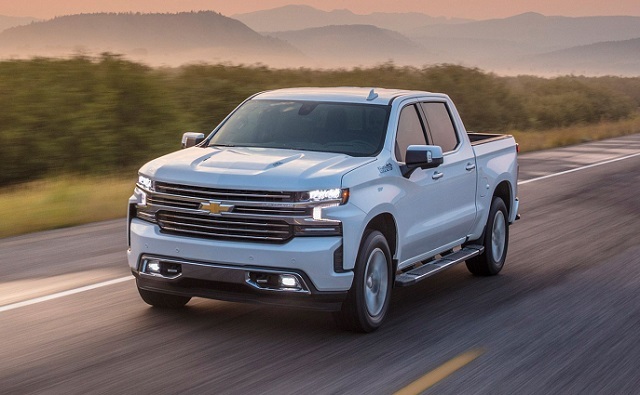 The recently redesigned Chevy Silverado 1500 packs plenty of modern tech and available features in more comfortable cabins and has also larger but lighter body and cargo beds. The Bowtie brand markets the model in various styles and equipped with different material and tech options. The versions change also the form in each trim ranging from the base-equipped variants, over off-road oriented models to high-value trucks. The multiple powertrain options provide also more potent or more efficient versions including also the turbocharged and diesel units. Following the recent redesign, the 2020 Chevy Silverado 1500 will return in the same form. Chevy will offer new options and add possibly new special edition version. There won’t be other notable changes until the mid-update. The model will again be available in three cab styles and trim range will include eight options. The powertrain range will include five engine options and three transmission systems. 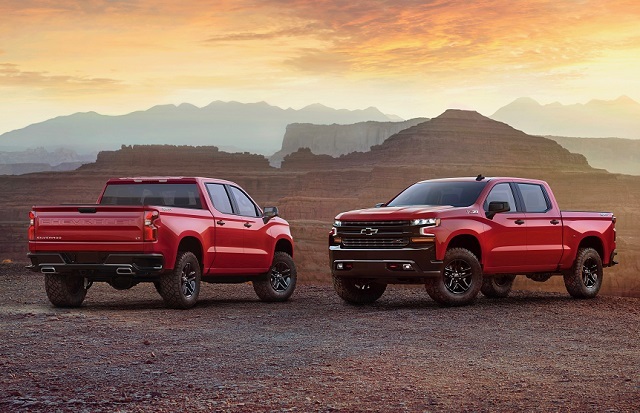 Buyers will have a hard decision to make when choosing the powertrain for their 2020 Chevy Silverado 1500. The model will offer various options including turbo, non-turbo and diesel units. The base-power Silverado 1500 will use a 4.3-liter V-6 engine producing 285 hp and torque of 305 pound-feet in the combination with the six-speed automatic transmission. Skipping the base trim and Custom will open the possibility for the 2.7-liter turbocharged four-cylinder engine. The turbocharged power will be routed via the 8-speed automatic transmission and engine makes 310 hp and torque of 348 lb-ft. The light-duty Silverado will also offer two versions of the 5.3-liter V-8 both rated at 355 hp and torque of 383 lb-ft. The base variant will be in pair with the six-speed auto gearbox and use Active Fuel Management system which shuts four cylinders to save fuel. The new Dynamic Fuel Management system can shut down from one to six cylinders and the version equipped with this system comes with the 8-speed automatic transmission. Another option will be a 6.2-liter V-8 coupled with the 10-speed automatic transmission. This engine will provide 420 hp and torque of 460 lb-ft.
For those who want the diesel-powered Silverado 1500, a 3.0-liter Duramax inline-6 engine will produce 277 hp and torque of 460 pound-feet mixed with the 10-speed automatic. The half-ton Silverado will come with the rear- and four-wheel drive and tow up to 12, 220 pounds. There will also be off-road upgrades including the Z71 off-road suspension components. Expect the fuel economy around 18 mpg combined for most versions while the turbocharged engine should provide up to 20 mpg combined. The 2020 Chevy Silverado 1500 won’t change much visually or structurally. The fourth generation Silverado 1500 is based on GMT T1XX platform and larger in all direction than the previous version. The model is also up to 450 pounds lighter than before and uses aluminum doors tailgate and hood. The styling of the model will define massive grille combined with slim headlights. The blocky front continues to the sculpted profile which has the bulged fenders and dynamic belt line. The rear has the step bumper and sleek tailgate combined with vertical taillights. The exterior treatment will depend on the trim version and the Work Truck model will get black grille and bumpers. The mid-range models will use body color trim and plenty of chrome details will appear in upper grades. The wheel sizes will switch from 17 to 22 inches depending on the trim version. Inside the cabin, the buyers will get plenty of comfort and well-ranged controls. The carmaker will use soft-touch materials where it is needed and add more premium feel in upper trims. The seats will also provide good body support and a commanding view for the driver. The model will start with the 7-inch touchscreen and smartphone features in the base version. A larger 8-inch display will appear in LT trim and above as well as 4G LTE and Wi-Fi. The equipment list will also include less costly upholstery as well as leather in more expensive variants. Buyers will also be able to pick dual-zone climate control, heated steering wheel and seats, ventilated seats, HD radio, Bose sound system, etc. The model also puts the focus on the safety and Silverado 1500 will offer a number of modern systems. The list will include packing sensors, blind-spot monitoring, rear cross-traffic alert, forward collision warning with automatic emergency braking, automatic high beams and lane departure warning with lane control. The 2020 Chevy Silverado 1500 will reach the showroom late in the year. Expect the similar pricing as for the current model. The basic model will need around $30, 000. It will lift the price above $50, 000 in high-range versions.